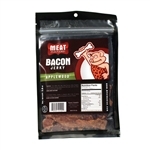 If you love bacon, then you have arrived! 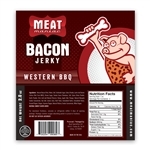 At Meat Maniac, we carry the wildest, most delicious bacon-flavored snacks and seasonings on Earth (and possibly beyond…we’re looking into it). 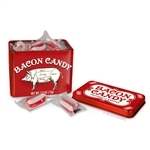 Our bacon snacks and candies include bacon mints and gumballs, bacon popcorn, and even bacon frosting for the ultimate cakes and cupcakes. 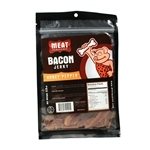 Don’t forget to try our bacon and cheese crickets and wash it all down with our bacon sodas! 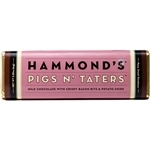 We have both milk and dark chocolate bacon bars, too, packed with delicious protein and chocolate greatness. 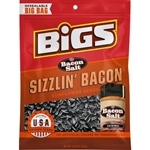 If it’s seasonings you’re looking for, we have the most exotic bacon-flavored seasonings, including jalapeno bacon salt and cheddar bacon salt, as well as hickory and original flavored salts. 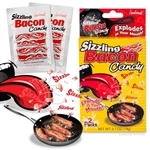 Bacon lube? 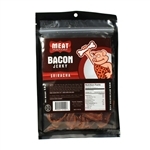 We’ve got it! 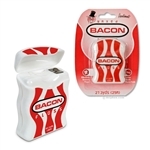 We have all the bacon-themed gifts you can shake a pork belly at, including bacon toothpicks and dental floss, bacon air fresheners, bacon lip balm, bacon soap, and much more. 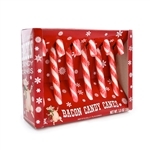 These make the perfect gift for the bacon lovers in your life and a great personal reward for all your deserving accomplishments! 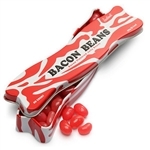 Shop around to find your favorite bacon-themed gifts and snacks to enjoy our great prices with fast, free shipping on all orders over $75 now, or contact our experts for help finding exactly what you need.